Secondary organic aerosol contributes to the atmospheric particle burden with implications for air quality and climate. Biogenic volatile organic compounds emitted from plants are important secondary organic aerosol precursors with isoprene emissions dominating globally.However, its yield of particle mass from oxidation is generally modest compared to that of other terpenoids.Herewe show that isoprene, carbon monoxide and methane can suppress the instantaneous mass and the overall mass yield derived from monoterpenes in mixtures. 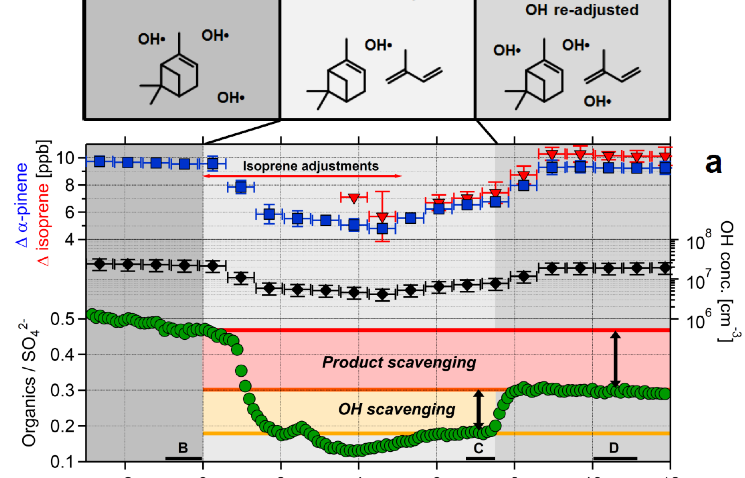 Wefind that isoprene scavenges hydroxyl radicals preventing reaction with monoterpenes and the resulting isoprene peroxyradicals scavenge highly oxygenated monoterpene products. Theseeffects reduced the yield of low-volatility products that would otherwise form secondary organic aerosol. Globalmodel calculations indicate that oxidant and product scavenging can operate effectively in the real atmosphere. Highly reactive, modest aerosol yield compounds are not necessarily net producers and their oxidation can suppress both particle number and mass.